Meijer nails the Easter concept with two great ads this week. 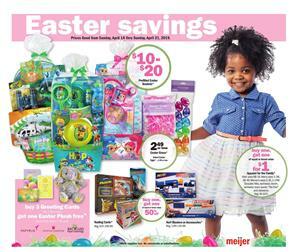 You can currently browse Meijer Easter toy sale ad and Meijer Easter sale. Both of them contain mainly toy products. Toybogananza is a promotion of this ad and it's a mix or match sale. Board games or puzzles, Crayola chalk, Children's Activities, and more items of the mix or match sale of toys. Traditional gifts like Easter toy baskets are also available in the Ad. Prefilled Easter baskets are an example of this. Enjoy blasters and summer toys like Stream Machine twin pack. Playing is the best when you are under the sun, open and fresh air, in your comforting place. Collaborate with your friends and family to enjoy great board games or puzzles. BOGO 50% off Monopoly and more board games this week. Meijer toy sale Ad contains LEGO sets and Beyblade toys, too. Great characters we love from the movies are toys. Buy Thor and Captain Marvel that are BOGO 50% off. Avengers Endgame will be on theatres on 26 April. Save up to $40 on gift cards. mPerks will help you save more on this kind of product range. Barbie is celebrating its 60th year and new dolls or playsets can be in the Barbie toy sales. Visit pg 5 of the ad to discover those. Mix or match sale is valid also on these products. Moreover, My Little Pony or Littlest Pet shop figures or playsets will be BOGO 50% off! Game consoles are in the ad and classic ones are available. Browse the latest Meijer Weekly Ad for grocery and weekly products as well.